This month’s featured CWC member is Gary Durbin, a retired serial entrepreneur and software industry pioneer. Instead of writing computer code and starting software companies, he now writes, hikes, and advises young entrepreneurs. He has published short stories and his first novel, Nano-Uncertainty. Gary led a research project into the use of artificial intelligence for business systems and an experimental project in computer-aided tutoring. Mr. Durbin holds four software patents, one for distributed inference on massively parallel computers. He has published several technical articles in magazines and journals and authored a special publication of the National Bureau of Standards. Beg, plead, or coerce people to read your stuff and give you honest feedback. What one thing has helped promote your writing most? Workshops like the Mendocino Writers Conference. What other facts would you like to share? 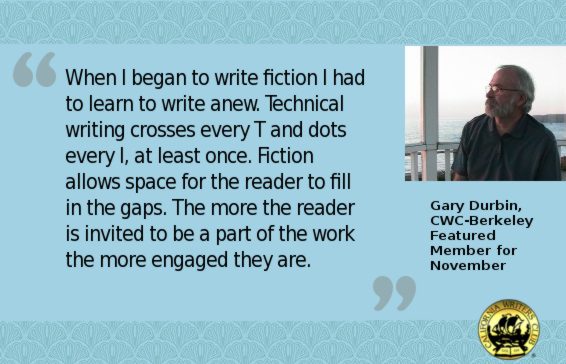 Remember that our members are your community, so treasure this opportunity to get to know Gary and find out how he can help your writers career, and vice versa. Members, don’t forget to come at 11 a.m. to participate in the craft and marketing support groups! Say you’re coming on Facebook.